﻿ What is Share the Slate doing for you? Sign up for our updates below! What is Share the Slate doing for you? 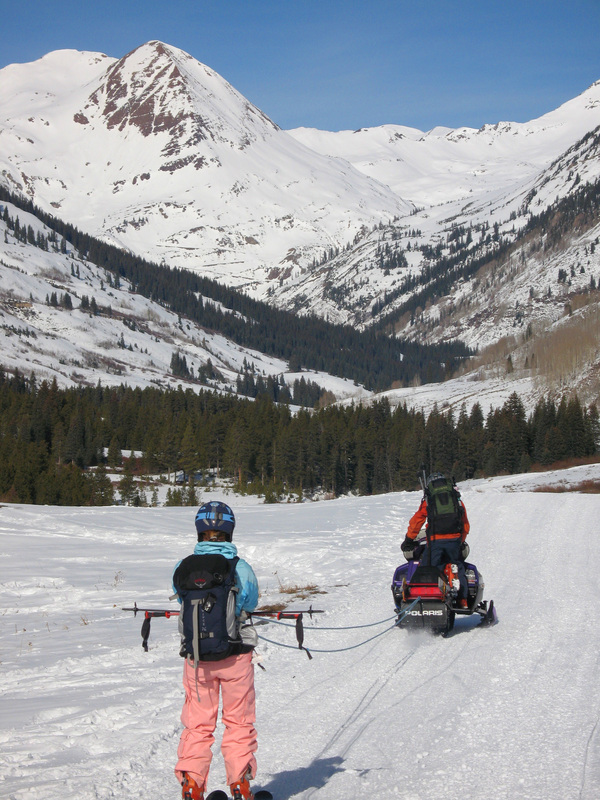 Backcountry skiers often use snowmobiles to venture deeper up the Slate River Road to a deeper and safer snowpack. We are striving to preserve winter travel access for all users groups in the drainages that encompass the Gunnison Valley. Outreach Education – We educate people about the new OSV Rule and what it means for Gunnison Valley and how to engage in the current Forest Revision and upcoming Winter Travel Planning process. Additionally, we educate backcountry users about other user groups, cultivating a culture of compassion. Code of Conduct – We are developing a code of conduct for winter backcountry travel so that all users can learn to coexist in our winter backcountry. Researching, Tirelessly – The situation at hand is indeed complex and we are pulling together our resources to obtain the best information possible to keep you, and us, informed. We also keep you informed of when we need you to take action. Communication – We communicate with National Forest, government officials, and other local and national organizations to advocate for our cause. We also encourage communication between user groups. Data Collection – We support third party data collection in efforts to support our cause. Currently, we have been working with various Masters in Environmental Management students at Western College University to gather data about the number and types of users who access our winter backcountry trailheads. As we grow, and identify more needs, our efforts will continue to expand. What is Share the Slate doing for you? Find out more about our outreach education, code of conduct, research, communication, and data collection efforts! Winter Recreation Layer of CBG Trails Now Live! 2019 Public Meeting on Thursday Jan 22nd! Winter Travel Management Lecture Series Starts This Thursday! Please join us for this year’s Paradise Cleanup! Help Pave the Way for the Future of Winter Shared Use!